Brighton & Hove Albion manager Chris Hughton. Pciture by PW Sporting Photography. Brighton & Hove Albion manager Chris Hughton felt his side 'deserved to win the game' but sought to focus on the positives after the Seagulls drew 0-0 at home with Watford in the Premier League this afternoon. After a thoroughly dreadful first 45 minutes, Albion rallied in the second-half but were denied time-and-time again by Watford's ex-England goalkeeper Ben Foster and the game ended in a draw. 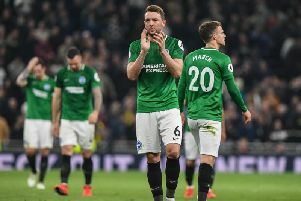 The result saw Brighton pick up their first Premier League point in three but also means that the Seagulls haven't recorded a league victory in five games. After the game, Hughton felt his side put in a much improved performance after their 4-2 away defeat to Fulham, hailed the display of Ben Foster, and revealed the reason for Dale Stephens' late withdrawal from the first XI. "It was frustrating because I think it was a game that we should have won. I think it was a game we deserved to win. "The positives are that it was a good performance and a clean-sheet. We came up against a Watford team and a goalkeeper that I thought made three very, very good saves. "We got into some good areas so the only disappointment I can have is certainly not about what players weren't prepared to do, particularly after Tuesday, because I thought they gave everything. "It's just that little bit of luck, a little bit of quality and of course a goalkeeper in good form that I think stopped us. "The positives are the clean-sheet and after Tuesday, which was hugely disappointing and unlike us as a team, that's what you wanted to get back to." "He was at Birmingham for a short-time when I was there so I've always known the quality of the 'keeper and I think he's been outstanding this season in particular. "I know he's had good season but this season particularly he has been outstanding. I was hoping that he wouldn't be so good today but I think he's a top, top class goalkeeper. "We were at home today and we have to remember also that we're up against a good Watford side that are having a good season and have been particularly good away from home. "I saw them play at Tottenham on Wednesday. Anybody playing against Tottenham are never going to have the bulk of possession, but I thought they played really well. "We were up against a very good team today. We created lots of chances which is a plus but the negative will be that if you get that amount of chances you've got to put some of them away." "He felt his hip on Thursday. He trained yesterday and got through the training so I thought he was going to be OK.
"He got up this morning and he said it was a lot sorer. We had the warning this morning but he came in and tried and we still thought that he would be OK to get through but in the warm-up it was obvious that it wasn't. "I think Davy has played their before and he was very good on the ball. I don't think it was an issue for him.